Background: Children with congenital heart disease (CHD) are at increased risk for behavioral, emotional, and cognitive problems. They often have reduced exercise capacity and participate less in sports, which is associated with a lower quality of life. Starting school may present more challenges for children with CHD and their families than for families with healthy children. Moreover, parents of children with CHD are at risk for psychosocial problems. Therefore, a family-centered psychosocial intervention for children with CHD when starting school is needed. Until now, the 'Congenital Heart Disease Intervention Program (CHIP) - School' is the only evidence-based intervention in this field. However, CHIP-School targeted parents only and resulted in non-significant, though positive, effects as to child psychosocial wellbeing. Hence, we expanded CHIP by adding a specific child module and including siblings, creating the CHIP-Family intervention. 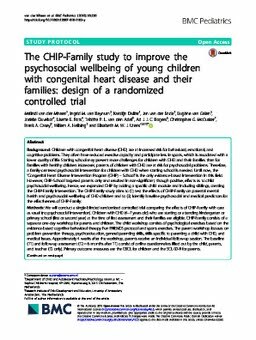 The CHIP-Family study aims to (1) test the effects of CHIP-Family on parental mental health and psychosocial wellbeing of CHD-children and to (2) identify baseline psychosocial and medical predictors for the effectiveness of CHIP-Family. Methods: We will conduct a single-blinded randomized controlled trial comparing the effects of CHIP-Family with care as usual (no psychosocial intervention). Children with CHD (4-7 years old) who are starting or attending kindergarten or primary school (first or second year) at the time of first assessment and their families are eligible. CHIP-Family consists of a separate one-day workshop for parents and children. The child workshop consists of psychological exercises based on the evidence-based cognitive behavioral therapy Fun FRIENDS protocol and sports exercises. The parent workshop focuses on problem prevention therapy, psychoeducation, general parenting skills, skills specific to parenting a child with CHD, and medical issues. Approximately 4 weeks after the workshop, parents receive an individual follow-up session. The baseline (T1) and follow-up assessment (T2 = 6 months after T1) consist of online questionnaires filled out by the child, parents, and teacher (T2 only). Primary outcome measures are the CBCL for children and the SCL-90-R for parents. Discussion: This trial aims to test the effects of an early family-centered psychosocial intervention to meet the compelling need of young children with CHD and their families to prevent (further) problems. If CHIP-Family proves to be effective, it should be structurally implemented in standard care.